If you'd like, I'm what you'd call an ex-(aspiring)filmmaker, an early vanguard of what promises to be, in one way or another, an eventual mass exodus from the film and television industries. I won't go into my reasoning behind film and television's future demise here, but suffice to say, if left to its own devices, the future of film and television is in the hands of peak oil and the collapse of industrial civilization. The reasons for why I quit the industry are wide and varied, ranging from a strong dislike of narcissism, an aversion to big business (which makes all the necessary high-tech equipment), an abhorence of the massive amounts of trash one sees resulting from a film production, a concern about the ridiculous amounts of energy (read: fossil fuels) that goes into making a film, and much else. It's the last one that I want to touch upon here, film and television in the age of fossil fuels and the climate change dilemma. Although I wasn't aware of peak oil ten years or so ago when I quit film and television once and for all (be it making the stuff or watching it), I was however aware of anthropogenic climate change – which I believed in back then, and still do today. That being said, I had a few problems coming to terms with climate change and the stupendous amounts of energy required to power all the massively blazing lights, cameras, editing systems, projectors, and everything else that went into my chosen line of work. Long story short, and to go along with the other reasons given, when I reached my impasse I decided to say "stuff this" and so went ahead and quit. Nonetheless, I'm apparently not much of a trend-setter, and so ten years on the film and television industries still seem to be doing quite good for themselves. In fact, last I heard, there's a new thing out there called (ahem) Nyet-Flix. In the meantime, climate change is still with us, an issue we often claim to have concern for, but which oftentimes seems rather confusing to me. To explain this, and although I usually refrain from doing so, I'll convey my thoughts via the referencing of a movie. The movie I want to recant here was one of the last I ever saw, and contrary to what I'd normally watch, not only was it a Hollywood-flick, but it was also a so-called "chick-flick." Starring an on-again off-again highest-paid Hollywood actress, the movie was called Sweet Home Alabama and revolved around the story of a young professional forced to make the decision of what kind of life she was ultimately going to lead, and which man she was going to spend the rest of her life with. Long story short, the young woman made her way up from a small Alabama town to New York City, where she became a highly successful fashion designer as well as engaged to the JFK-like son of New York City's mayor. The wedding was to be held in her former hometown, where, as circumstances had it, she bumped into her former beau. Although there's various nuances and stereotypes in the film that I could disect – but won't – the one thing I'll point out is that at least the movie didn't portray her as having to choose between the New York City sophisticrat (which the guy was) and a stereotyped "country-bumpkin." Anyway, long story short, the young woman ended up ditching the sophisticrat at the altar and proceeded to seek out the more down-home guy. This is where my beef with the movie comes in, particularly as I was in the process of quitting the film biz myself and transitioning over to a more agrarian way of life. Supposing there was a moral to the story and it wasn't just a means to peddle popcorn and fizzy drinks, the gist seemed to be that a young woman might think it a good idea to go for the more humble fellow than the vainglorious big-shot. However, what I couldn't help but ponder over was who a young girl might take as a role model here. The character in the movie, or the famous Hollywood actress (who inherently made the opposite decision the character she was playing had made)? It's here that I start thinking of climate change movies. The ultimate moral behind film and television? Obviously an elaborate explanation about climate change movies isn't necessary here, besides me stating that they generally point out that climate change isn't a very good thing, and that they are often interspersed with actions we may take, some of them more effective than others. 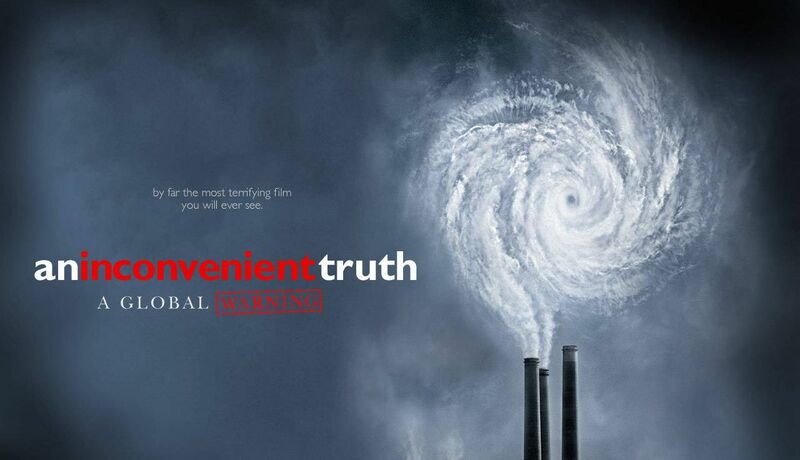 However, much like the Hollywood movie decrying the high-life, yet actually defending it, can it not be similarly stated that climate change movies decry fossil fuels yet actually stand up for the fossil fuel-binging film and television industries? Granted, to cry "hypocrite!" is a bit diningenuous, considering that none of us are saints here and that we're all implicated in this in one way or another. As Wendell Berry has put it, "This is original sin, round two. The best we can do is admit our guilt and then do what we can." That being said, there are those who think that there is no "sin" involved here, and that the issue is essentially a technological and bureaucratic one. As the freeloading entrepreneur Elon Musk put it a while back, burning fossil fuels and adding C02 to the atmosphere is "the dumbest experiment in history, by far." By this is implied the notion that we don't need fossil fuels for industrial civilization and can replace them wholly with "renewable" energies. 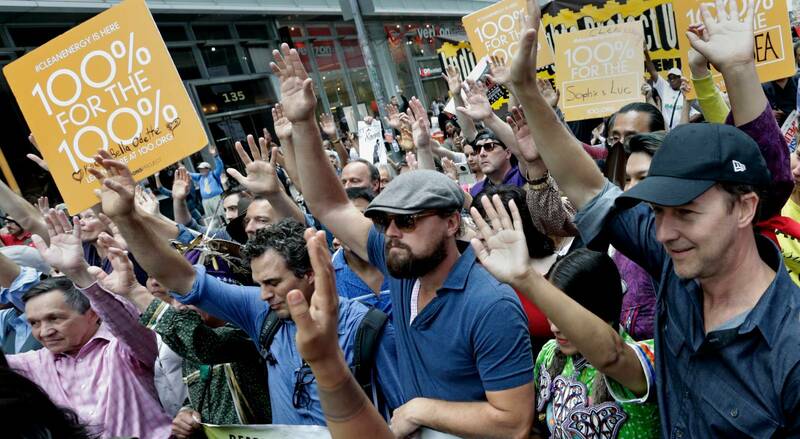 This is a favorite cause celebre of Hollywood celebrities and their acolytes, who can be seen tramping down New York City streets proclaiming 100% for the 100%, as well as participating as board members for organizations such as The Solutions Project which proclaim that we can have "100% clean, renewable energy." This is, however, an utter impossibility, all the more ovbvious if one does the math and pay attention to the four laws of thermodynamics. Of course, the predominant reason why it's so easy for celebrities and their acolytes to be bamboozled in regards to 100% fossil fuel replacement is largely due to their overwhelming desire to want reality to be as such. For if we believe that fossil fuels can be completely replaced with "renewable" energies, then there isn't really any need to question the way we live our lives. In effect, fingers can be pointed at politicians and industry leaders for dragging their feet in regards to making the necessary maneuvers needed to bring about the supposed possibilities of "100% clean, renewable energy." This is all very crucial for fossil fuel-binging celebrities (and their admirers) who above all want a clear conscience and who aren't all that interested in questioning their livelihoods. To put it a bit differently, and to quote the late author Upton Sinclair, "It is difficult to get a man to understand something when his salary depends on his not understanding it." The fact of the matter is that the film and television industries are incontrovertably dependent on rampant commercialism in order to pay for, and subsidize, the massive costs inherent to them. And commercialism, incase you aren't aware, is a major stockholder in runaway climate change. Putting aside my opinion that, if nothing else, peak oil and other energy constraints are eventually going to see to it that film and television go the way of the dodo bird, it would be extremely beneficial if we ourselves went ahead and proactively sent film and television to dodo bird territory by choice. And really, seeing how some usages of fossil fuels aren't so easily jettisoned (like driving to work), and some are rather inconsequential and mostly token gestures (like fancy light bulps), what could be more viable, and have wider ramifications, than the ditching of film and television? Since we need to cut down on fossil fuels (be it due to peak oil or climate change), and since the commercialism behind film and television are a significant contributor to the lifestyle behind our fossil fuel binge, I'd say it's worth wondering what the ultimate lesson of climate change films is – to quit film and television and actually make a significant change in our lives, or to pacify ourselves into thinking that it's okay to keep on making and watching more and more film and television? What if, for starters, we were to somehow put a moratorium on at least climate change films? One obvious problem would be that children who must learn about the issue would be denied that source of information. But then what if their teachers told them "we used to watch climate change films, but we stopped doing that," explained why that is now the case, then gave them non-film and television lessons on climate change? What kind of lessons and mentality might that instill in our children? If we're ever going to take climate change seriously and not just look like we care (as we are taught by the lessons that actors essentially teach us), then I'd say that it's fair then to ask when we're going to "walk the talk" and actually make as significant of a gesture as ditching the worlds of film and television. That being said, if we don't do it ourselves, the fact of the matter is that in one way or another, it's going to be done for us. A waning, pathetic exit as it attempts to hold on for dear life amongst diminishing fossil fuel supplies, escalating costs, and the gradual collapse of industrial civilization. A rather quick exit due to some sort of catastrophe that befalls the world and renders film, television, and much else unviable, amongst a rather fast collapse of industrial civilization. A conscious decision made by many of us, if not most of us, to ween ourselves away from the participation – as creators, distributors and watchers – of film and television. Although the third option is my preferred one – and the one I've chosen to be a part of – it is, quite obviously, a long shot if there ever was one. That being said, if we're to make a serious attempt at avoiding the worst effects of climate change, and have a fighting chance at leaving some of those fossil fuels in the ground, then I'd say it's the wisest choice to make, and possibly the best thing we could possibly do in the face of looming and ever-increasing threats of climate change. That being said, and although I favour option number three, I'd be lying if I said I wasn't looking forward to the end of film and television, whichever way it comes about.